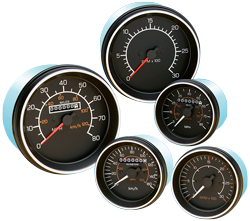 VIS offers two families of replacement gauges. Both families include speedometers, tachometers, pressure and temperature gauges, and fuel level gauges. 500 Series speedometers and tachometers are available in 5-inch and 3-3/8-inch case diameters and have barrier strip connections. They can be configured in the field using DIP switches. These models have black bezels, orange and white scales, orange pointers, and bulb backlighting. The speedometers also are available with chrome bezels and white pointers, and in 12- or 24-volt models. 500 Series speedometers are driven by magnetic sensors. They have dual scales and are available with 80 MPH, 100 MPH or 160 KMH primary scales. 900 Series speedometers are available in 3 3/8-inch or 5-inch cut-out sizes. They feature a microprocessor-controlled stepper motor for high accuracy, a talc-filled-polypropylene housing, and an LCD display counter. The speedometers have a glass lens with splash-proof front seal, high-visibility pointer, easy-to-read dial, and externally accessible switches for easy field calibration without test equipment or signal generators. Users can choose from striped, black or chrome bezels; orange or white pointers; English or metric dials; and 9-32 volt operation. These quality instruments accept either magnetic sensor or sender-generator inputs and are available with or without dial subscales.